After his self-immolation, the local security took him away and some young Tibetan men followed the vehicle to take Kunchok back. Kunchok passed away at the hospital on Dec 1st and only a part of ash was returned to the family. Info: [ VOA Tibetan ] Kunchok Kyab, a 29 year old man, carried out a self-immolation protest on November 30, 2012 in Ngaba. Kyab was taken away by security forces and his condition is unknown at present. A number of Tibetans who approached the security forces to demand the return of Kunchok Kyab are missing and presumed to be detained. DHARAMSHALA, December 3: Adding to the growing death toll in Tibet’s self-immolation protests, another Tibetan self-immolator passed away in a Chinese hospital, days after he set himself on fire protesting China’s continued occupation of Tibet. Kunchok Kyab, 29, set himself on fire near a gas station in the Shagdom region of Dzoege, eastern Tibet on November 30. He was forcibly taken away by Chinese security personnel, reportedly to a hospital in Barkham, where he passed away on December 1. Speaking to Phayul, Kanyag Tsering, an exiled monk who has been closely monitoring the situation inside Tibet said Kunchok Kyab succumbed to his injuries at a hospital in Barkham region of Ngaba in the evening of December 1. “Only a portion of his ashes were handed over to the family members,” Tsering said. Following the news of Kunchok Kyab’s death, a large number of local Tibetans and monks started visiting the deceased’s family, against strict orders, to offer their last respects and condolences. The same source added that the wellbeing and whereabouts of a group of young Tibetans who followed the Chinese police vehicles after seeing Kunchok Kyab being taken away, remains unknown. “We are not able to contact our sources in the region and thus have very little information on the present situation in the region,” Tsering told Phayul. 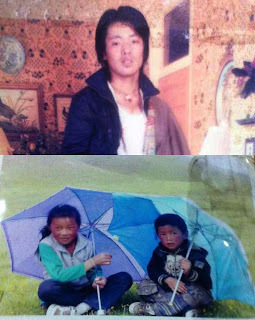 Tibetan self-immolator Kunchok Kyab's two children in an undated photo. Many of the Tibetan self-immolators have died under unknown circumstances in Chinese custody after being taken away alive by security personnel. Last month, Tsegyal, a 27-year-old old father of two passed away in a Chinese prison after he was denied any medical attention for 12 days. Tsegyal set himself ablaze on November 7, in Tingser village of Bekar town in Driru (Ch: Biru) region of Nagchu, Tibet on the eve of the Chinese Communist Party’s 18th National Congress. From November 7 to 18, Tsegyal received no treatment for his burns while being held at a local police station in Nagchu town where he succumbed to his injuries. Tsegyu is survived by his two children, a six-year-old and an eight-month-old infant. The deepening crisis inside Tibet has witnessed large scale anti-China protests and a series of self-immolations that has now seen 91 Tibetans set themselves on fire, since 2009, demanding freedom and the return of the Dalai Lama from exile.